This was my second year venturing out to Babes In The Dirt from the East Coast. Last year I was connected to some CA locals to help me make the trip out, so this year I knew exactly what to do. So I connected with some other East Coast ladies to make the trip together. Something that really stood out to me through all the planning and travel was how I'd met all the girls that I flew, drove and rode with through motorcycling - specifically through all-female events. And while we're still practically acquaintances, having kept in touch mostly through social media, everyone was a perfect pleasure to make the journey with! I'll be the first to tell you that I'm not that outgoing. I'm an introvert, and when I attend an event it's not uncommon for me to retreat to my own tent or van for some alone time to recharge. I've also never been particularly a girls-girl; my dude friends have always outnumbered the ladies. SO...how did a girl like me end up traveling with a cluster of other women I hardly know? The answer is: I love riding, I love an adventure, and I just so happen to meet the best people on two wheels! Babes in the Dirt was a whole other animal this year! It grew in size to almost 700 women! And, it occupied a new event space in the Quail Canyon Motocross Park and Group Site, complete with multiple tracks and a pavilion. It was inspiring to see what event co-founders Anya Violet and Ashmore Ellis have grown this event to be. It was equally amazing to see all the sponsors (Husqvarna, Fox, SENA, Thousand Oaks Powersports, See See, WLF Enduro) that once again went above and beyond to make this event special for all the ladies riding! 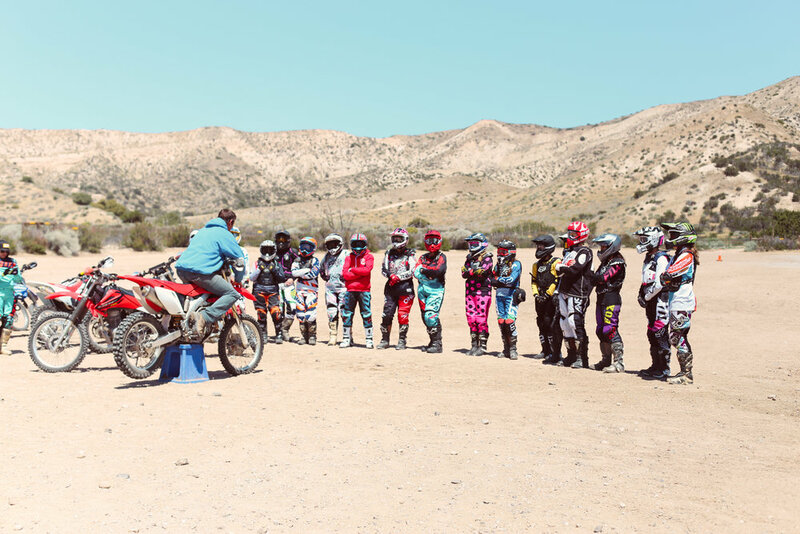 One of the best things about this years' event was the addition of more training classes with Garrahan Off-road. The Garrahan team did an amazing job getting ladies rolling. I ride pretty frequently, but every rider can benefit from training, so I signed up for a training class. At the last minute I offered it up to a new rider (and new acquaintance!) in my group, Catherine. Somehow she'd missed the original signup, so she was beyond stoked to have the opportunity. Well, Catherine loved every bit of it, even the inevitable bumps and scrapes. She walked away with a nice little elbow "trophy"...and a big smile! It was a great experience to once again ride in a different type of terrain than I'm used to. I don't ride in sand much, and the landscape is just so different (to me at least) from the East Coast landscape. It's visually different as well, the height and exposure, the angles of things. I see a lot more in my range of vision than I do in tight woods - so it becomes a good learning experience to adjust to some of these changes. And, when the day of riding is done, it's so great to just hang out and do whatever you want to do. 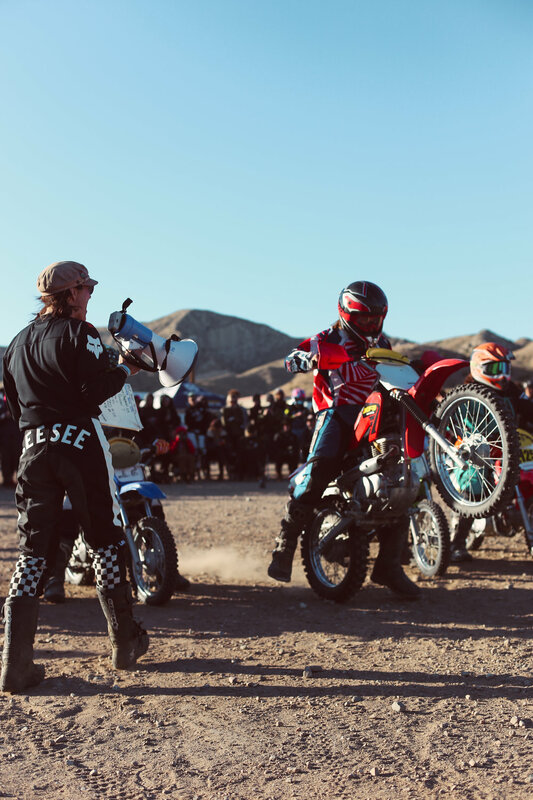 We grabbed camp chairs, kicked back and watched the mayhem and carnage of the the mini races run by the See See Motorcycles crew! And it's always awesome to grab some food, maybe a drink, and spend some time connecting or reconnecting with other girl's like you who are just happy to be there having fun! Over And Out is proudly sponsored by Babes In The Dirt, and inspired and motivated by the fun and adventurous ladies in the motorcycling community.